Let’s chat about chinos. They’re arguably the most versatile pant option out there. Denim (even the dark, inky variety I always suggest) still tends to skew casual on the formality scale. Chinos, however, have the ability to go either way. Purists argue that chinos, like denim, are inherently casual and don’t always work in business environments. This is true – to an extent. Casual dress is widely accepted nowadays, even on the job. That means chinos are the perfect pant for modern workplace style. The following article is a quick guide to chinos. It’s jam packed with great info. Why not download a PDF copy to your computer or mobile device? The terms “khakis” and “chinos” are often used interchangeably, though the correct word is actually chino, which applies to the actual pants themselves. Khaki is, arguably, the most common color of chinos – which is probably why the terminology gets confusing. So khakis are chinos, but chinos aren’t necessarily khaki-colored. The stylistic differences between a “formal” pair of chinos and a “casual” pair are slight. 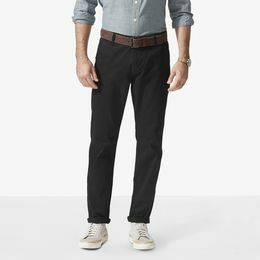 Formal chinos tend to look like dress trousers, except they’re made of cotton twill instead of wool. Look for extended tab waistband closures, front slant pockets, back welt pockets with button closures, optional pleats, center creases, and cuffs. Casual chinos tend to look like your favorite pair of denim – standard side pockets, back patch pockets, rivets or bar tacked stress points, flat felled seams, and standard hem. Formal scenario: Let’s imagine you want to wear chinos to work. Your office is business casual, and you’re not sure what to wear with them. 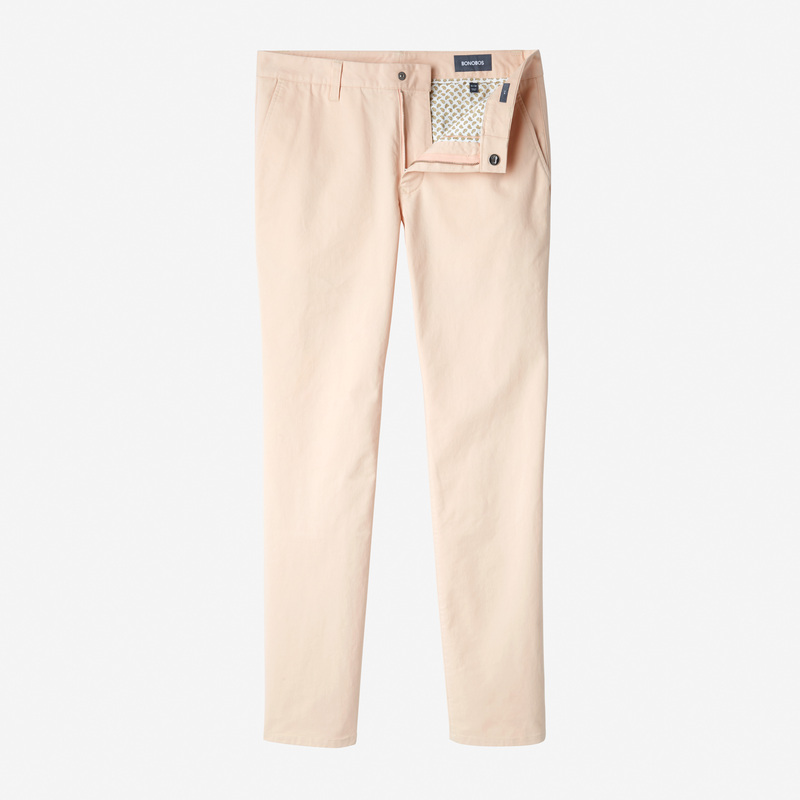 Treat your chinos like dress trousers. Wear a dress shirt, silk knit tie, sport coat, and leather loafers. Casual scenario: Wearing chinos casually is easy. Treat them like you’d treat denim. Wear a plaid sport shirt and Top-siders. How about a blue chambray shirt and driving moccasins? Printed polo and fresh sneakers? Joggers are a type of casual pant made from fabrics like twill, chambray, and sometimes wool. They have a regular waistband (though sometimes elastic) and an elastic hem. They’re like a hybrid pant / sweatpant… thing. Are they OK to wear? Sure, why not. As long as you’re expected to dress casually wherever you’re headed, you can pull it off. Should you adopt the trend? Depends. As I write this, the jogger style is still current. Although, it’s been in stores for a few seasons at this point. If it’s a trend you want to incorporate into your wardrobe, I say go for it. Keep in mind, though, that this style in particular skews far to the casual end of the style spectrum. These pants are perfect for lounging around, running errands, and hanging out with friends – but are not business casual appropriate. Your standard, run-of-the-mill chino should work for you all year round. Still, it’s possible to find lighter- and heavier-weight versions as those specific seasons approach. You’ll certainly be more comfortable wearing seasonally-appropriate versions, that’s for sure. 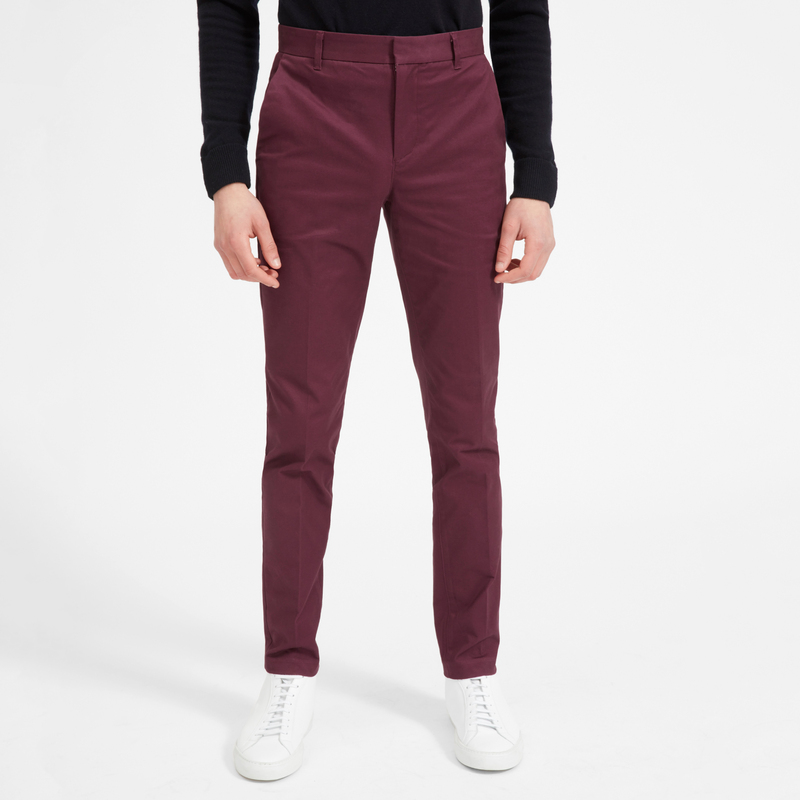 What differentiates the warm-weather from the cold-weather chinos? Pay attention to fabric weight, fit, and color. Let’s break down each of these. When shopping around for your warm-weather chinos, look for those marked “lightweight”, “summer weight”, or “tropical weight”. They’re usually around 5-6 oz. fabric weight. Standard fabric weight is probably around 7-9 oz. Heavier weight twill is 10+ oz, which would work great for cold weather. Casual chinos not only resemble the look of your favorite pair of denim, they also wear and fit the same way. 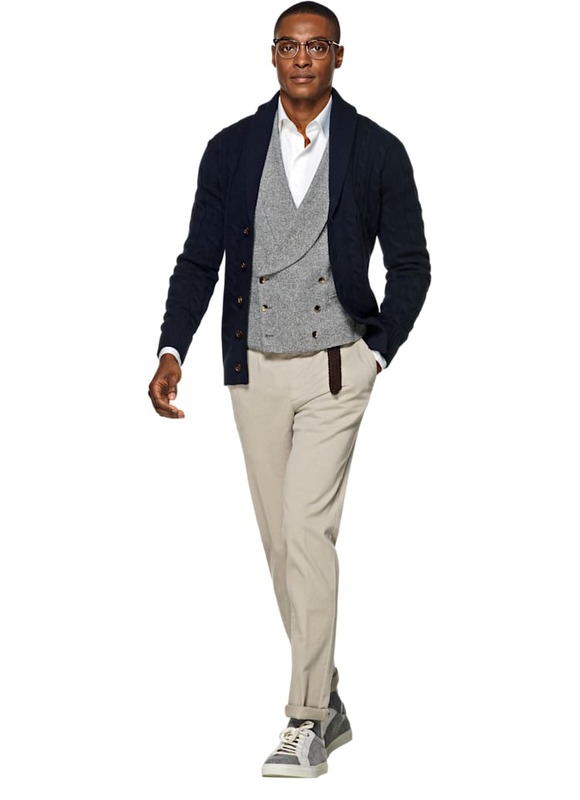 Casual chinos will typically have a regular or slightly lower rise, be cut slim, and have a minimal break. Formal chinos should fit more like dress trousers. Remember, your main goal when looking for well-fitting trousers is to maintain a clean line from the waist to the leg opening. Too tight or too long and you compromise the drape and clean lines. Same goes for your formal chinos: a bit looser (like your dress trousers), a slight taper from knee to ankle, and little to no break at the hem. Clean lines, clean lines, clean lines! The most versatile colors all year round are navy, charcoal, caramel / British khaki (a darker shade than your usual khaki), and olive. Summer is the perfect time to wear light, pastel shades, and other interesting colorways. Light pastels and vibrant shades (think seafoam green, salmon, red, stone, white, and sky blue) are evocative of warm weather and tropical locales – they work perfectly during the spring and summer. Mustard, burgundy, emerald and forest green, bright navy, eggplant… all these colors are great for the colder seasons. If your outfit is casual, you may want to give minimal canvas / leather sneakers, Top-siders (boat shoes), or desert boots a shot. Contrast is a good thing. For your standard pair of khaki chinos, white shoes work. Dark brown leather or navy too. So long as your shoes aren’t an exact color match of your pants, you’re fine. For formal trousers, you can’t go wrong with brown brogues or oxfords. If it’s warm out, experiment with suede loafers or drivers (depending on the formality of the situation, this may or may not be appropriate). Anything I didn’t cover here? Let me know in the comments below, and I’ll do my best to answer your questions. And if you’re still a bit stumped when it comes to matching, have you seen our checklist: 5 Matching Mistakes? I can send you a copy right here.